Firstly, let me reassure you……snakebite fatalities are now virtually unkown in Hong Kong. 40,000+ people die every year from snakebites…but NOT in this part of China. There ARE poisonous and even deadly snakes in Hong Kong and you should be aware of them, but most are very rare and/or nocturnal – you are very unlikely to “bump” into one – and even if you do, none are overtly aggressive, so they will quickly disappear. Note also that 90% of these snakes are nocturnal. Six land species can inflict life endangering bites (the Banded Krait, the Many banded Krait, Chinese Cobra, King Cobra, Coral Snake, and the Red Necked Keelback). These “elapid” snake bites cause nerve related damage. The two other venomous snakes – both pit vipers, the Bamboo and Mountain Pit Viper – have bites that can cause extreme pain and swelling (and still pose a fatality threat to children and dogs). Five other snakes have enlarged poison fangs at the back of the jaw (opistholglyphous), but are not known to produce much reaction in humans…phew. The Common Rat Snake and the Burmese Python are not poisonous, but do get very large, and their teeth can cause nasty cuts and gashes. There is NO easy way to tell venomous from not, unless you actually know the snakes…and even then ID is not always clear in the heat of the moment. (Can you really tell that the third supralabial scale is NOT touching the eye and nasal scale? be honest). So basic principles apply…leave them alone, and they WILL leave you alone. You will not be attacked by a snake – why would it? it cannot eat you! – so all known snakebites on humans are defensive, and the result of being stepped on, or putting your hand where a snake is hiding, or limited to someone handling a snake. Snakes in Hong Kong are shy and timid, and will try and “run away” if they can. But, if they think they are being attacked then some of them will turn very aggressive, and they can move extremely fast. The krait can even turn its head back on its own neck/body to bite anyone silly enough to try holding him there….so don’t! Don’t pick up snakes to try and move them…we know of someone who wanted to help a snake off a path, but ended up in hospital with a painful serious bite. If you want to help, use a long stick. If you don’t want to see snakes then stick to the trails. It is highly unlikely that you will surprise each other up close. If you want to venture off into the bush then a)make a lot of noise as you walk. Most will disappear when they feel the vibrations of your walking. b)Walk with a stick, and if you are walking in vegetation beat the bushes in front of you, or part the greenery as you walk. That way you will not suprise it. As you walk any snakes you come across will try and escape rapidly from your presence….which is very reassuring. 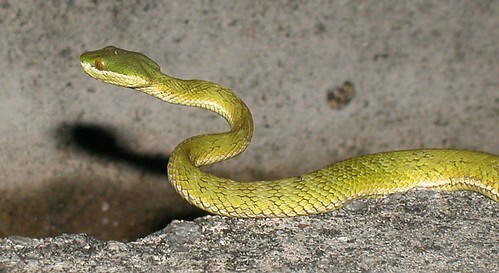 BUT – as always, – there is one exception:- The Green Bamboo Snake AKA the Green Pit Viper. Most of the bites i have heard of are from this snake and my wife knows three people who have been bitten (all are fine, but had very painful swelling). The Pit Vipers are nocturnal, so you are unlikely to meet them during the day. If you see a green snake during the day it is more than likely the harmless and inoffenisve Greater Green Snake. The Pit Vipers end up biting people bcause they like to ambush their prey, so they do not normally move when they hear you, and rely on their camouflage to remain undisturbed; plus they can “see” and can strike at night using their heat sensing pit organs. For all the snakes and their differences see the list below…. 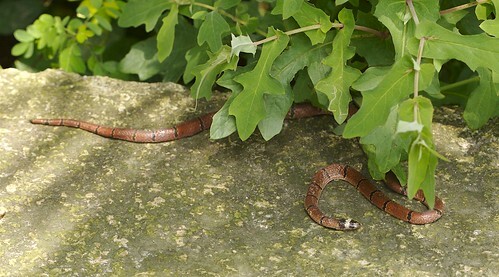 As a general rule you are far more likely to see snakes in the warmer months….from March to November, as they are cold blooded and rely on heat to move around. If you WANT to see more reptiles and snakes then go to their habitats – see information on that under the discussion forums for each species. Hiking carefully around the Country Parks look carefully in the right habitats, take your time and be patient, keep your eyes peeled and listen carefully for a tell-tale rustle in the leaves or bushes, and then you can normally see one of the more common species of lizards, and probably snakes too. If you have a snake near your house then it is a good idea to have it removed…for both of you….options include calling the police (who are supposed to capture it and take it for release to Kadoorie Farm, but often the snake is killed). 1. WILLIAM If anyone reading does need one removing from their place, I’m happy to do it, as the police simply kill them, regardless of whether they are protected or not. Please feel free to call me 94708442. 2. Another snake contact is Dave Willot – a dedicated snake saver, who would rather be phoned and come around to pick up the snake than have one of you kill it. You can phone on his freely available number which is (already published in books and therefore in the public domain) 23282526. 3. info@goateetoni.com reaches a local TV/Herp “celebrity” who runs interesting educational programmes including about herps. Now very rare due to loss of habitat. Mainly nocturnal. Nocturnal, extremely dangerous and fatalities have been recorded in Hong Kong. Highly distinctive black and white markings. c.50-100cm. Has 30+ distinct bands. Mainly nocturnal, but sometimes out during the day. Extremely dangerous and fatalities have been recorded in Hong Kong. Can be black, grey, brown or even golden! with or without lines or spots. Like the King Cobra, can easily be confused with a the Common Rat Snake, but lacks the distinctive black head bars of the Rat Snake. Has an expandable hood and a binocular/monocular pattern on the back of it. World’s largest venomous snake, up to 6m. Rare in Hong Kong. Extremely dangerous and fatalities have been recorded in Hong Kong…mainly from staff in snake shops! Nocturnal, and very uncommon. Distinctive reddish colour. Mainly active during the day. Bright distinctive red neck. Only recently considered dangrous due to fatalities overseas. Probably the most common of the venomous snakes listed above, and the one you are most likely to come across when hiking in the hills of Hong Kong. Venomous, nasty – but not fatal. Triangular shaped head with many small scales, with a thin distinct neck. Reddish end to its tail. red or golden eye. Slit pupils. Keeled/pronounced scales. Rarely moves away. heat sensing pits around mouth. Photo Credit: Roger Kendrick. aka HK Moths. Closely resembles the greater green snake which is harmless, which has large scales on head, no distinct neck, brown eye, with round pupil, no red on tail, no heat sensing pits around mouth. clear? You can click on the pics below for a bigger shot. Here is a shot of the head of the pit viper…. Not Venomous, but bites can hurt. A highly protected species. Most are around 2-4m in length. They are powerful and vicious, and will bite readily. Known to take the occasional dog or goat. More of a nuisance to farmers than a threat. Quite common, one of the rare daylight only active snakes. Will bite readily.